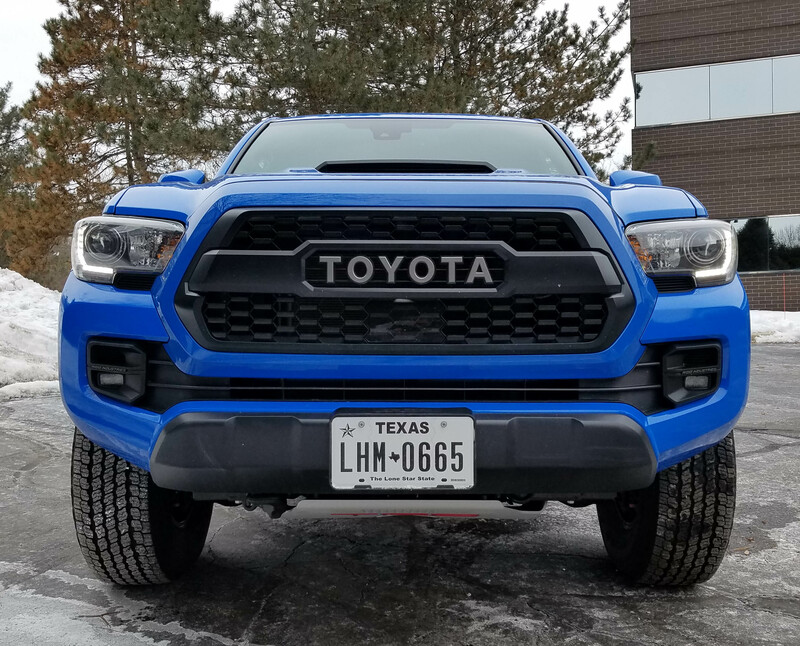 Certainly if you intend to bounce and bound over the dirty, rocky, sloppy outback, the Tacoma TRD will get you there and back. First, it has 4-wheel-drive available at the turn of a knob on the dash. Second, there are controls overhead that allow the truck to creep down a steep hill (hill descent mode) safely, meaning that the light open bed in back won’t precede the nose and cab down the incline. That 5-button terrain select system also allows a driver to choose the proper traction settings for five off-road conditions like sand, rocks, mountain terrain, etc. Don’t worry about bending up the shocks or doing damage underneath. 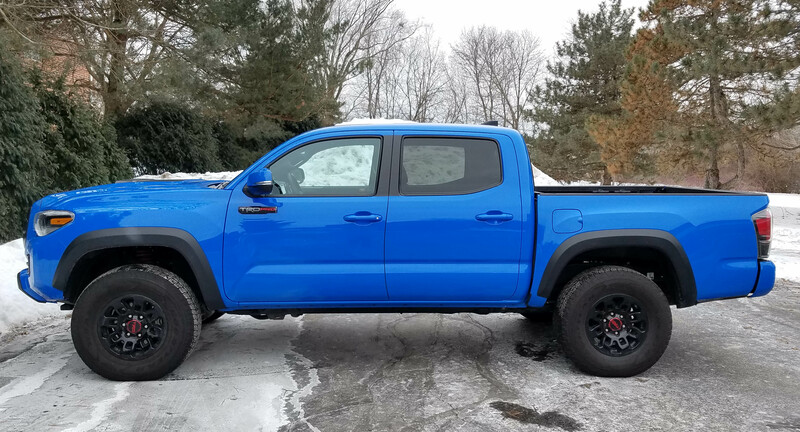 This mid-size pickup has 9.4 inches of ground clearance (more than a Chevy Colorado) and the TRD package includes rough and tumble Fox 2.5 internal bypass shocks with rear remote reservoirs. In practice those will soak up a lot of off-road banging and thumping. Underneath there also is a ¼-inch thick skid plate to protect the truck’s undercarriage and keep you from leaving parts along that rocky mountain trail. In back is an electronically locking rear differential to aid in traction and power control too. 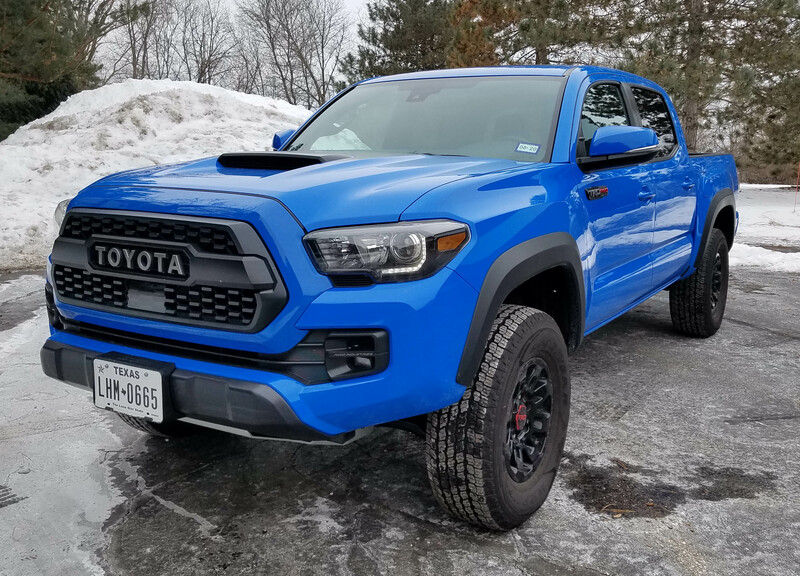 So if you’re heading for the hills, this is your machine because even if it’s a little beat up, Tacoma pickups hang on to their resale value due to their reliability. Ah, but if you’re a city dweller, mostly what you’ll get here is an image boost. Practically speaking the TRD is a beater on city streets. Those shocks may help on rocks, but pot holes and giant pavement cracks simply shake the Tacoma like a Mardi Gras reveler spinning a noise maker. The ride is rough despite the truck’s 127.4-inch wheelbase, making even an older Jeep’s ride seem tame by comparison. Macho dudes probably won’t be bothered. Power is fine, as Toyota’s 3.5-liter, dual-VVT-i V6 cranks 278 horsepower with a 265 torque rating. While no fireball around town, if you tromp the pedal there’s plenty of oomph here to haul you and the family, or a load of brush, or pull a decent-sized trailer. The tow rating is 6,400 lbs. Tacoma still uses a 6-speed automatic transmission while other competitors are moving on to 8-speeds to save gas. That might be wise as our gas prices are superballing their way toward $2.50, or more, a gallon. I got just 15.9 mpg in my test drive, mostly on city and suburban streets in cold and snowy weather. The EPA says to expect 18 mpg city and 22 highway. Handling is typical pickup of yore in that there’s plenty of steering wheel play, sort of slushy. But you get used to it quickly and steering effort isn’t difficult. Brakes also seemed to really need some major leg pressure here as the Tacoma wanted to keep on truckin’ as it approached stop signs and lights. It has been a while since I had to press this hard to whoa down even a bigger pickup. On the plus side, Toyota includes its Safety Sense P on all its vehicles now. The system features smart cruise control, lane departure and sway alert, automatic high-beam headlights, and pre-collision warning and braking with pedestrian sensing. Also standard here are blind-spot warning, rear cross-traffic alert and parking sensors. Outside, of course, is a 5-foot composite bed in back for hauling. Plus there are electrical outlets, a deck rail system with tie-down cleats and an easy-lowering tailgate that can be locked. 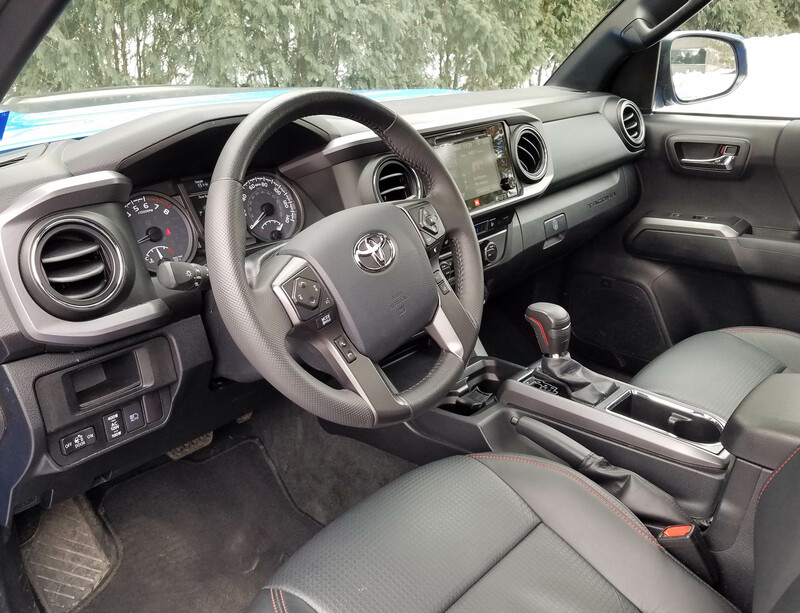 Inside, Tacoma’s cloth seats with faux leather side trim, are quite comfortable with good support. All are manually adjustable as the Toyota offers no power seating on any trim level. Most competitors do. The blue truck’s interior was all black with some red stitching on the seats. Dash was a textured black with a graphite gray facing, while the console was textured black plastic. Styling is what I’d call early Transformer, very square and mechanical looking, so a bit of a throwback look and very male-oriented. I liked that the cloth seats were both heated and cooled, with three levels of each. The thick leather steering wheel is not heated though. Controls were easy to see and use with big buttons and dials for climate controls and such. The touchscreen works well and is easy to tune and adjust, with large on-screen channel select buttons. However, you must take off your gloves to use these. Overhead is a sunroof, the sun visors slide and there are those off-roading buttons on a sort of roof console that includes a HomeLink system. Down low is a wireless phone charging station just below the center stack. Missing here is a D-shaped steering wheel to increase knee room when entering and exiting the truck. Speaking of which, all that ground clearance is great for off-roading, but makes climbing aboard a serious stretch. 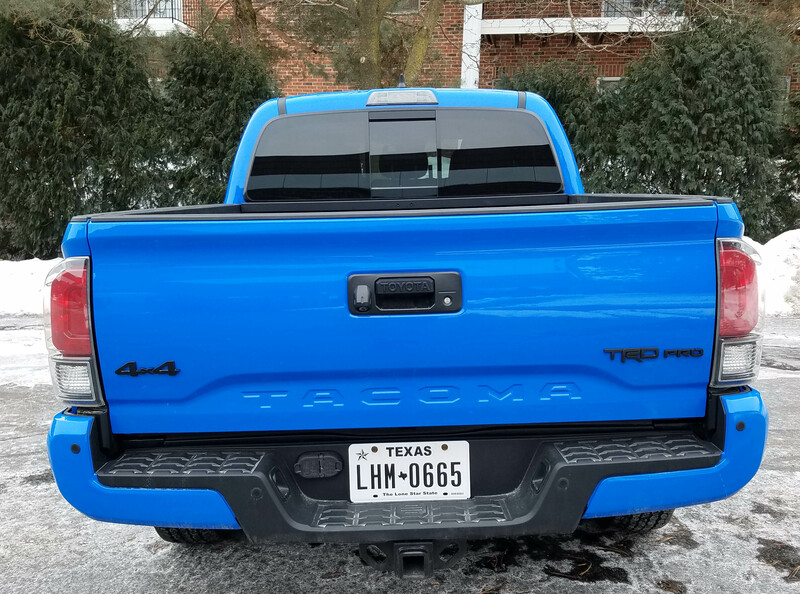 There are no running boards on the TRD, which may limit its sales simply to drivers who are 6-foot tall, or more. Boards are a $795 option. Buy them! That said, you’re already going to be parting with some major coin if you buy the TRD Pro trim level, one of six trims. 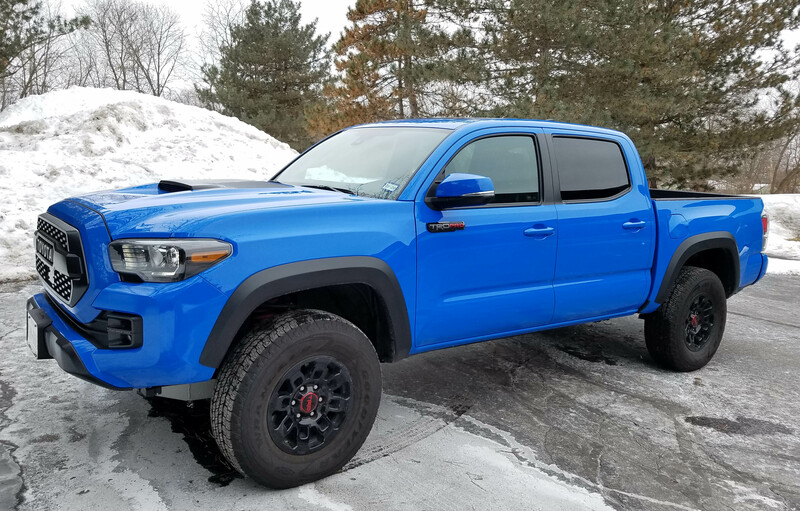 The test truck listed at $46,410 with delivery charges and it added no options, although it should have added running boards. 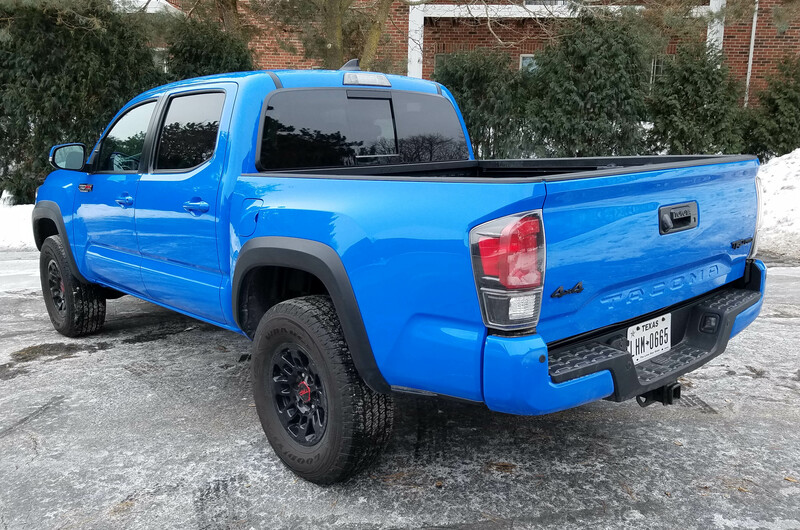 This is the top of the line Tacoma, but folks needing a mid-size pickup instead of one of the current crop of monster truck full-sizers, can start with an SR at $27,475 including delivery. However, the SR comes with a mild 159-horse 2.7-liter I4 engine and front-wheel drive. The next level up is the SR5 at $29,310, then the TRD Sport, TRD Off-Road and Limited before you reach the TRD Pro. Your call on just how much truck you need, but there are plenty of choices to mix and match with their various options to meet your budget. Tacoma is a strong, reliable pickup. But if you go whole hog with a TRD Pro there’s a price to pay, both literally and through the seat of your pants. Boys may not care! 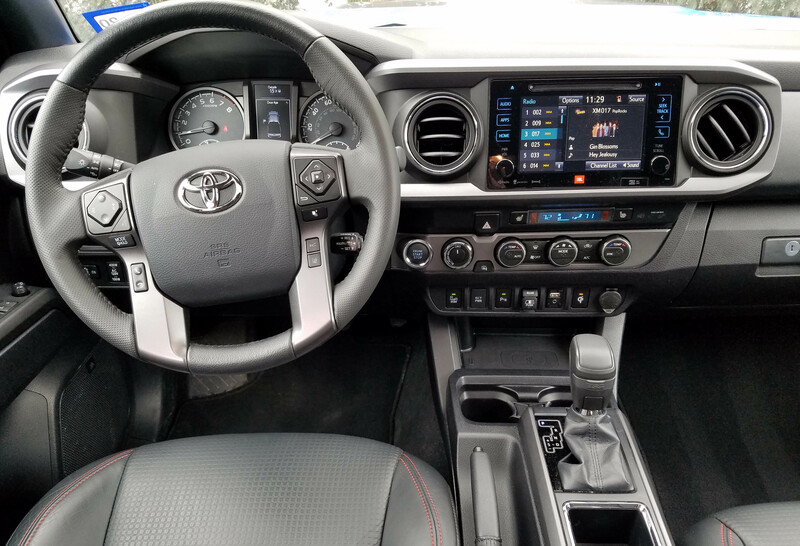 Hits: Built mainly for off-roading, comfy seats, 3-level heated/cooled front seats, sunroof, blind-spot warning and backup camera plus Toyota Safety Sense P, 4-wheel-drive, wireless charging, good power and towing ability, OK touchscreen function, reliable with good resale value. Misses: Rough ride on roads, poor mpg, pricey trim level, needs running board or steps and could use D-shaped steering wheel.